This week, a Rolex Ref. 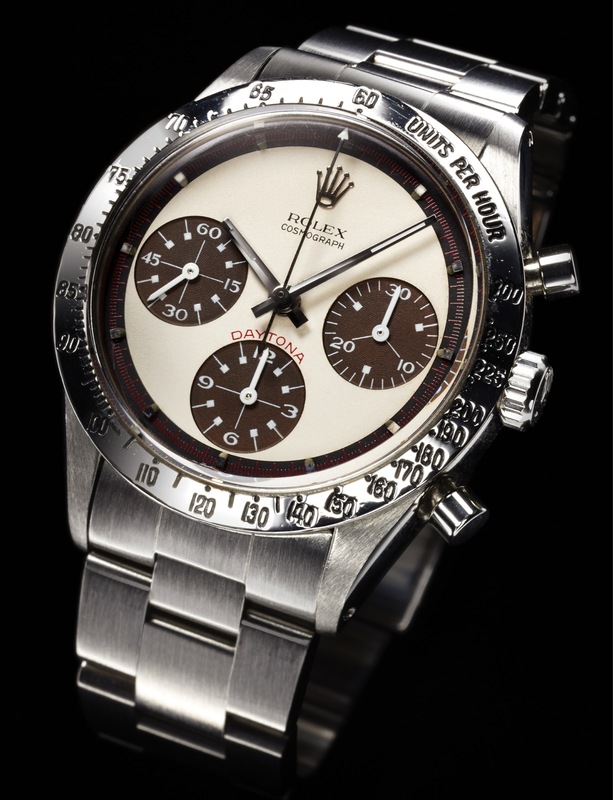 6239 Paul Newman, one of the most sought-after vintage Rolex sports models, will be hitting the auction block. Rolex Ref. 6239 Paul Newman tropical steel Rolex, Cosmograph Daytona, case No. 1695326, Ref. 6239. Made circa 1965. Fine and rare, water-resistant, stainless steel wristwatch with round button chronograph, registers, tachometer and a stainless steel Rolex Oyster bracelet with deployant clasp. Accompanied by service papers dated 05/30/95. The watch will be featured in Antiquorum's auction on June 22 in their New York City premises. Highlighting the sale is the Rolex Ref. 6239 Paul Newman with Tropical Dial in Steel. The watch is a legend amongst collectors. These models of Daytonas are distinguished as Paul Newmans by their dial. The design features an Art Deco style font for the numerals, giving it the exotic dials feature. In the mid-1960s, the time these pieces were produced, the dial was not an instant hit with Rolex collectors. Instead, buyers preferred the classic style as opposed to the multi-colored dials on the Paul Newman model. This lead to many Paul Newmans being kept in cases for years, along with their accompanying receipts. As these watches, at the time of production and release, were not popular, Rolex did not make many of them. Which of course, today, increases their value in the eyes of collectors of rare timepieces. Their rise in value over a ten year period is staggering. For example, in 1992, Antiquorum sold a 6239 White Dial Paul Newman for $9, 257. Jump forward to 2003, when at the same auction house another 6239 White Dial sold for $39 434, and then again in 2008 for $66 000. In 2013, the same model, 6239 White Dial, sold for $75 000 at Christie's in New York. Check out more realized prices for the 6239 Paul Newman here. The 6239, the same model which is up for auction at Antiquorum, is arguably the most authentic as it was the reference that Newman himself wore. 6239 feature both a white or black dial. The dial is a three color dial of black, white, and red and features "Daytona" written above the register at 6 o'clock. The fun nature of this watch makes it standout amongst classis Rolex designs, making it the most famous and coveted of the rare Rolexes. The piece up for auction at Antiquorum is a tropical Paul Newman. Tropical Rolexes get their name from the brown colored dials. Incredibly, a Lemon dial Paul Newman sold last year at Antiquorum for more than $840,000, thanks to its solid gold Oyster case and never seen before dial. Antiquorum's auction will take place on June 22, 2017. Check out the full catalog here.